We are learning about social issues in our books. 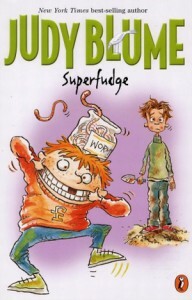 My book is Superfudge by Judy Blume. The social issue of the book is that Peter’s mom is having a baby and the social issue here is that now all the attention goes on his sister and he doesn’t want her to be like Fudge, Peter’s younger brother. The other social issue is that they are moving to Princeton, N.J. for a change. These can be called social issues because he needs to suffer through all of the changes that has happened in his life. Another issue that Peter has to suffer through is Fudge’s new pet bird is annoying him in his sleep. Another thing that me and my group is thinking is that Fudge has a mental problems and one example is that he kicked his teacher and another thing is that when he grows up he wants to be a bird and he climbed up where they but their backpacks over the shelves. Since he started kindergarten he is thinking that he needs special attention because he is now the middle child. Once they move to Princeton Peter is upset but happy at the same time because he now has a friend named Alex. This happens in the middle of the book. Towards the end of the book Fudge is now behaving in school and at home. They kind of trick you about at first but then he talks about big words such as a privilege and unanimous. Most things that Fudge do are issues for Peter. Peter’s sister is actually not going to turn out to be a replica of Fudge. I think that Fudge is growing up now because he and Daniel ran away to the pastry shop but they went after Alex and Peter went. At the very end they actually goes back to their normal life in the city. Colonial day was awesome! During Colonial day we learned what children and adults did in colonial times and what they did while they were bored or for work. We did candle making, dame school, stencils, toys and games, music, dance, lunch, tinsmithing, and textiles. I like everything that was there. The cookies and pie were amazingly very good! The final dance was awkward but it was fun. What I enjoyed the most was dressing up like colonial women. Our class did some experiments about erosion and weathering. I loved all the experiments we did. They were all so fun. I just can’t make my mind up on which one was my favorite. The first one we did was about the water cycle. We had water in a container, clear wrap, and a ice pack. We put the water in the in the container and put the clear wrap on with a rubber band. Then we put the ice pack on top of the clear wrap and we had to wait about 5-6 minutes. We took our pointer fingers and tapped the wrap and water fell, like rain and it was a like creating a water cycle. We also did some soil component experiments and some water effecting experiments. Hi. I am Neha and this is my new blog! I need to tell the biggest truth of all and that is that I am a little scared of my blog because what if they don’t like my work that I am putting on my blog? Well I finally got that out of me but I am also so excited because I am in charge of all the things that I put it on my very first blog but this isn’t the first blog I have had but I am not jumping into that because I am not going to make you guys bored. This blog is mostly for my work or just some things that our teacher wants us to do. I am very also nervous and all my work on this blog. What if this post is not the right one. Who knows but my teacher. I am going to post all my things till college or not. My computer teacher Mr.Casal is making us this blog because then it will be more easier to get to it. That is all I am really thinking about this blog what I am going to talk about in my blog.